This is a Finest Quality Handcrafted Gold Plated Brass Heart Shape Keepsake Pendant with beautiful hand engraving. Each Keepsake Pendant brings memories to an even more personal level by holding a small portion of cremated remains. 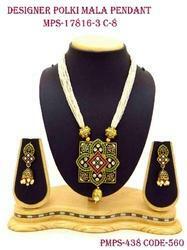 This is a gold plated jewelery set made of copper and brass as base metal ang plated on gold. By leveraging upon our extensive market knowledge, we provide the best array of Gold Plated Bridal Pendant Set. We are India’s leading producers and exporters of all kinds of Fashion Jewelry and Accessories. Incepted in the year 2016, we “Maitri Exports are engaged in manufacturing and wholesaling a wide assortment of Artificial Ring and Necklace Set. - Avoid direct contact with Sweat / Water for longer time. - Do not bring jewellery in direct contact of perfumes of any type. - Store in plastic boxes only, do not use velvet boxes.